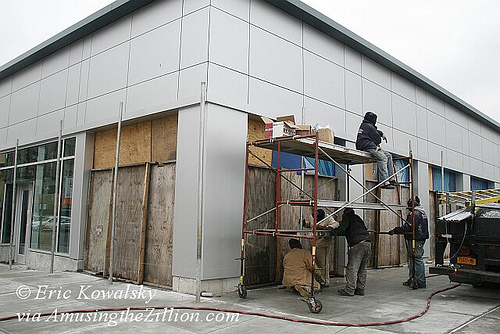 On Wednesday, workmen drilled holes into the new sidewalk all around Thor Equities sterile-looking new building at Surf and Stillwell in Coney Island. When poles were inserted close to the structure, observers wondered if they were going to install a chain link fence. Instead, they began installing unpainted plywood all around the building! The joke going round is Thor CEO Joe Sitt read the bad reviews of his first-ever new construction in Coney Island and felt so ashamed that he tried to hide it from public view. With no sign of any tenants, Thor probably wants to protect the glass from vandalism and graffiti. Last year’s best was “Blight for Spite” scrawled below Thor Equities name and logo. As for street art, the blue construction fence with murals painted by No Longer Empty artists Ephameron, Veng, OverUnder and ND’A was removed earlier this month. Some of the art turned up in a jumbled reassemblage at another Thor construction site in Bensonhurst. 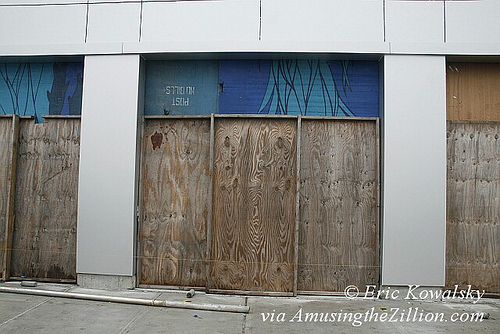 In the photo below, taken on the Bowery side of the Coney Island building, bits and pieces of Ephameron’s mural can be seen. Thanks to Coney Island photographer Eric Kowalsky for being on the scene and snapping these photos. 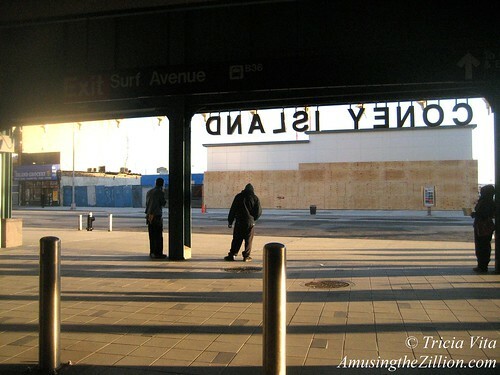 More than likely the boards will soon be plastered with the “Stores for Lease” signs that have been a fixture on Thor’s vacant property in Coney Island for the past several years. How about commissioning murals to replace the ones that were chopped up and discarded? The building is the first sight you’ll see when you exit Stillwell Terminal. It occupies the site of the century-old Henderson Music Hall, which Thor Equities demolished in 2010. Shame? Some people don’t know what shame is. Tricia….Why are fences erected?? To mark boundries, protect areas, stop tresspassers, decorative additions or to conceal something. Knowing Joe Sitt what do you think? I don’t think it’s gonna be a amusement ride, another food operation or T-shirt, souvenir vendor either. What’s your guess anyone? Sterile is too kind of a description. Thor’s soulless construction is the true definition of urban blight. you might get a laugh out of this comment but to me it looks like it just might be the book store he was always preaching about that coney island needs lol..it truly does not fit in with other building,and it’s purpose was to be a temporary structure.what ever goes in (new tenants) they will be able to have a year round situation due to its location.well lets hope for the best if anything .he had gotten premission from the dept of bldgs for it to be temporary.later down the road a hotel will be on this site. What a travesty . . . I wish my family had been rich and never had to sell this property. Truly hideous and heartbreaking. Joe Sitt and his company are into land speculation. Buying land cheap, with minimum investment, sell it at a profit. When he heard about the possibility that land in Coney Island would be upzoned, he purchased as much land as he could, in hopes the upzoning would increase the value of the land, which it did. But to sell it to a hotel chain, the old historic buildings stood in his way. If those buildings were ever landmarked, even though the current administration and Landmark preservation committee chose not to, a hotel could not be built, thus limiting his potential profit. So he had to take down Henderson because as long as it stood, it could always be landmarked. Any building built by man can be labeled a ‘temporary structure’ What is the opposite of temporary? Permanent. There is no such thing as a permanent structure. If something is still standing today that was built at the beginning of time, no one can 100% guarantee that it will still be standing to the end of time. That ‘temporary structure’ will stand till someone is foolish enough to sign as lease to build on his land, or pay his price to purchase his land. Years after rezoning, no such person has stepped forward. You can label a structure being temporary, but that is just a label. It doesn’t mean anything about how it is built or how long it is allowed to stand. To me, with its center pit, it looks more like a gas station then a retail store. As I stated before, Joe S-itt doesn’t care what goes up on any property he has acquired. All that matters to him is turning a buck! If S-itt could purchase say the Vatican and he got a offer for a hotel/parking garage…he would do it. The Somali pirates could take lessons from Joey(mr. coney island) S-itt. Considering a auto dealership went out of business nearby on the north side of Surf, it wouldnt surprise me that he built this to house another. Here’s a photo that I took on Presidents Day of the plywood now going up around the building, probably as a base for advertising. Also, as I wrote earlier this month: The building has yet to sport any signs of tenants, but the Coney Island Rumor Mill has been saying for months that a Johnny Rockets (“The Original Hamburger,” founded in 1986 in L.A.) is coming to the Surf Avenue side.